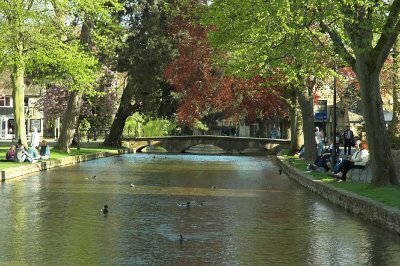 Bourton-on-the-Water is the setting and football is the game but it's football with a twist. None of this eleven a side business with 45 minutes in each direction played on a pretty pitch of green. This is six a side with 15 minutes in each direction played knee deep in a river. 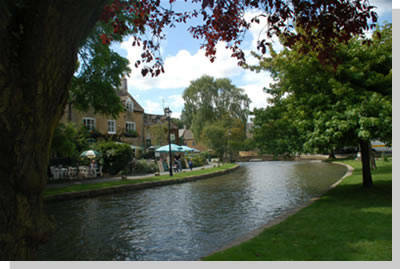 The Windrush River, a 3 metre wide babbling brook, is the water in 'Bourton-on-the-Water' and is also home to one of the Cotswold's more bizarre festivals. The tradition of Football in the River has been around for over seventy years with the modern event attracting a number of local sides and hundreds of spectators to boot. The villagers of Bourton-on-the-Water have played football in the River Windrush every summer for 70 years. Goal posts are set up under the bridges and players brave the cold knee-deep water wearing nothing but bright coloured football shorts or fancy dress. Hundreds of spectators line the river banks and cheer for their team in a splashy, noisy affair that spills out onto a cheery fête on the village green.